General Pickett of the Confederate Army was invited to a shad bake dinner to be accompanied by peach brandy a mere couple of miles behind the Confederate lines at Five Forks, Virginia. He may have hesitated leaving his command, but it was late in the day and long in the war. Tempting. Two hours before sundown, as he enjoyed dinner while near by through the woods and over a rise the Battle of Five Forks began. The battle has been referred to as the Waterloo of the Civil War. General Pickett didn't hear the battle from his dip in the land. Arriving too late to change the course of the battle, he surely was feeling a rush of panic. He must have realized that he forgot to leave anyone in charge. I have read accounts of this battle. The Union armies finally captured the railroad that was the supply line for the Confederate forces at Petersburg and Richland. The battle was on April 1st, 1865. The truce for the war was signed three days later on April 3rd. A few months ago my sister and I celebrated the 149th anniversary of this battle. Without the shad bake dinner and the failure of General Picket's leadership my grandfather might not have been captured and my sister and I would not exist. We didn't have a shad bake, but now maybe that should become the tradition for this day. These rather ordinary woods are the precise location where my grandfather would have been wrapping up the day cleaning his gun weary from marching and hungry. Unsuspecting of the battle to begin. I have tried to conjure up what he must have felt like on this day in this place. He was only twenty, but had been fighting for three years. His Company's battle record lists Fort Stedman and the Battle of the Crater as two other possible battle locations. While I was in Virginia, I drove an extra hour late in the afternoon to try and reach the Petersburg Battle Grounds where these are located. 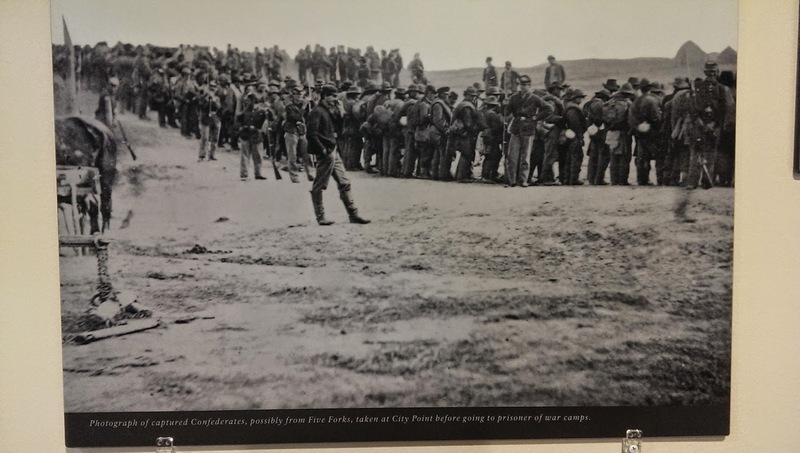 Captured Confederate Soldiers at Five Forks. Possibly with Robert in this view. This serious looking young man, my grandfather, Robert Templeton, had seen more than I will ever face. This photo was taken after the war. I think of him as most determined, yet at times afraid. His war records list him in the hospital after the first year suffering with ulcers. Talking with rangers at the Petersburg Battlefields, they said that "ulcers" could have been just the common dysentery. He later spent time in a second hospital. After the war, he went home and at first ran a whiskey still. When he became a postmaster of the little town of Mooresville, North Carolina, he served under a number of presidents. He was proud of his military service. One year his company commissioned a medal for themselves. 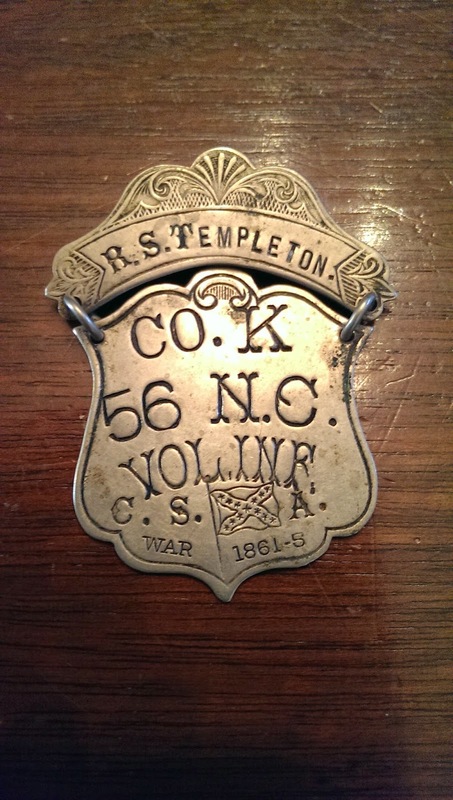 I had asked the rangers at Five Forks and also at the Petersburg Battlefield if they had seen a medal like this before. Neither had, but they thought that it was not unusual. What a lovely remembrance for the grandfather we never knew!